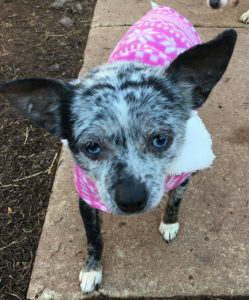 Taisie is a sweet and gentle blue-eyed beauty who was rescued directly from a Lancaster County, PA puppy mill after 8 years of breeding for profit. All she ever knew was a life in a barn producing puppies. She lived for years with untreated allergies and a skin infection. But she is so sweet and loving and learning to live indoors in comfort surrounded by love. Taisie is sweet, loving and playful! Taisie is good with dogs! Taisie is good with children. A secure, physical fence is required!